The Halal Food Festival is the world's largest halal consumer food show, showcasing innovative halal products, high end restaurants, live demo kitchen, cooking school, with world renowned chefs, and halal mocktails! Come on Haloodies, let your taste buds go wild! Come visit us! Wow, a MASSIVE Halal Food Festival in London's Excel Centre. Taste buds watering already? Email them, phone them, write to them, tweet it, facebook it. Do what ever you can and tell them why you want to boycott the event even if you weren't going to attend. Make it clear that the ONLY reason for the Boycott is that its HFA accredited. Showing that we won't support it and we will save others from it IF it's sponsored by the HFA. Please use the contact details below to show your concerns and if they reply, please post it here. When in DOUBT leave it OUT! This was an email reply to someone concerned about HFA. The initial email started with questions as to why HFA was not always Halal. I replied to the email with some major points taken from the then HFA website. However, HFA have sinced changed their website and re worded it. The animal must be sacrificed by a Muslim. The animal must be fit and healthy. The animal must NOT be shown the knife it is about to be slaughtered by. The blade must be kept sharp at all times for a swift cut. Each animal is slaughtered with its individual Takbeer. they mass slaughter, i.e. they place all the animals in a row and pass them through the machines. They also say that if an animal is missed, then these are slaughtered by the muslim men on site. This means that the animal gets cut by the machine but does not die and is badly injured. According to the Ulama, in this case of mass slaughter, only the first animal is Halal because the takbeer was said to it as an individual. People say that if mass slaughter techniques were available in the time of the Prophet, then he would use it. This is wrong because the Prophet never showed any cruelty to any animal, therefore the above mentioned methods are used. www.halalfoodauthority.co.uk/zibah-definition.html they contradict point 4. 6. Whence slaughtering is carried out in a mechanised plant, say for, poultry slaughtering, because of expediency of machinery and fixed blade operation, licensed Muslim slaughterman/men should be present to do the rendition of shahada. Number of slaughtermen depends on the speed of the machine/line. Generally it is accepted that a healthy young male can recite shahada approximately fifteen hundred times per hour. It is therefore, suggested that we have 2-3 Muslim slaughtermen at the slaughtering station/s of medium abattoirs. These slaughtermen would also slaughter with full recitation of shahada any bird/animal that are missed by the machine. Latest definition on thier newest website. �Zabihah require animals to be alive and healthy at the time of slaughter, since carrion is forbidden and, jugular vein, carotid artery and windpipe have to be severed by a razor sharp knife by a single swipe, to incur as less a pain as possible. Here the only difference is that a rabbi will read what is required by his faith and, a Muslim will recite tasmiya or shahada, which fulfills the requirement of dedication. The question of how to overcome the issue of recitation of shahada on individual bird whence we now have poultry being slaughtered at a rate of six to nine thousand per hour, has already been addressed. A Muslim is commanded to commence all his deeds in the name of Allah. The question of how to overcome the issue of recitation of shahada on individual bird whence we now have poultry being slaughtered at a rate of six to nine thousand per hour, has already been addressed. A Muslim is commanded to commence all his deeds in the name of Allah. InshaAllah I will try and find out where this has already been addressed and how they can justify it. from every point of view of Islamic Shari’ah and dietary rules. So now we know who their Ulama are, well at least some of them because there are other contraversial names involved too. Is this a press release in English? Makes no sense can someone translate the following into English from the above press release? Now lets do the maths if, for arguments sake they, they protested. Point 6 says 2 or 3 men. Lets take 3. Now 3 men can recite the tasbeeh 1500 times non stop. So that would make it 4500 tasbeehs. But here www.halalfoodauthority.co.uk/definition-of-halal/ they say 6000 to 9000 chickens an hour. So in their own words and definition of this pathetic method, half of their chickensa are HARAM by their own books. MCB (Muslim Council of Britain) talks about Boycott. We are demanding that the Food Standards Agency and all local authorities to adopt it's own 'Guidance note on halal food issues' as issued by Ms Sarah Appleby, Head of Enforcement and Local Authority Delivery Division. The mislabelling and misrepresentation of Halal foods is of great importance to the Muslim Community, and continues to be an issue of concern. For this reason we are re-issuing the advice drawn up in association with relevant Muslim organisations, LGR and Defra. Food enforcement officers are requested to: Use this advice when planning inspections, food sampling and labelling checks relating to Halal foods Take appropriate enforcement action. HFA president Khawaja Masood told MeatInfo.co.uk the media was making a "mountain out of a molehill" as it was only traces of pork DNA found in the products. He said: "It is not the case of an ingredient, rather a case of DNA being found. As a result a boycott of all HFA certified products with immediate affect by various religious authorities has been announced. Has anyone received any replies from the these people. It seems like they too are in it for the fame, name and money. Has anyone received any replies from the these people. It seems like they too are in it for the fame, name and money. 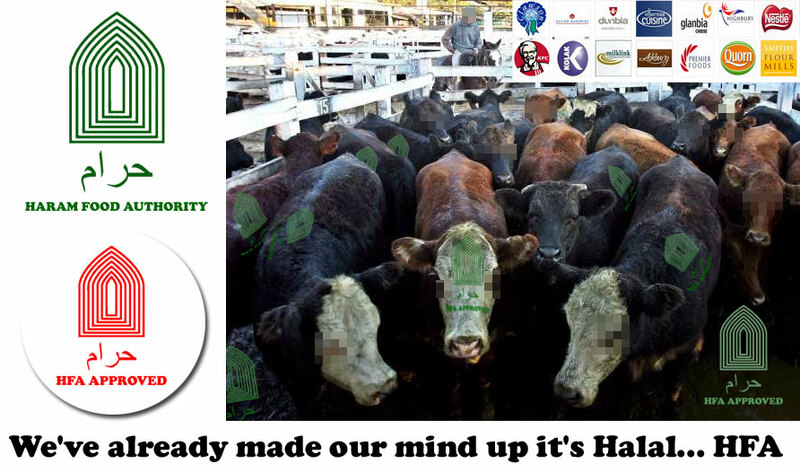 Did you know that the Halal Food Festival is being organised by the son of Masood Khawaja president of the HFA. His full name is Noman Khawaja. And the event is being organised with the HFA? This is all a mess. The rest you will have figured out! Mind That Food and Drink(s).